I don’t drive. I have never driven a car. Despite this, I have been on a lot of road trips. I am pretty much an expert on being a road trip passenger. I’ll write a handy How-To Guide on it one of these days, but today I am going to speak of a time in 2014, when AlexT and I went 2,400 miles in a little loop from NYC to North Carolina, through Ohio and back to Newark, NJ. It took nine days and many things happened. But one thing stands out (for the purposes of this article, at least). You’ll find, sometimes, at the end of a journey when you look back, the trip had some themes that appear. My most recent trip just a couple of months ago had two themes: World Fairs and Morbid Obesity. 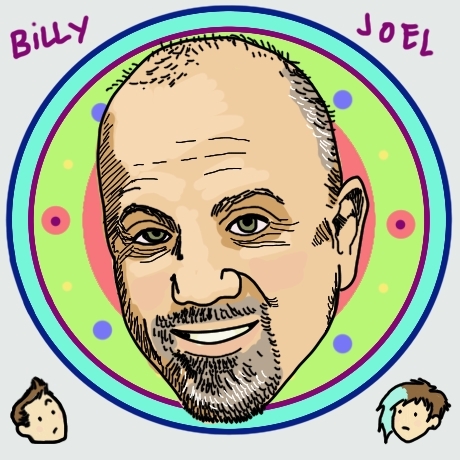 In November of 2014, one of the most stunning themes was Billy Joel. Billy Joel’s music is kind of easy listening. He has been a hit that spans decades and generations, and yet, at least in my opinion, it’s almost unremarkable music. It is easy to forget that you are listening to a specific artist. He’s like Elton John or Kenny Loggins or something that way. It is also how Rod Stewart would be except he has an easily identifiable rasp in his voice. It is music you know and have heard a whole lot so it’s comforting to hear, but it might take a normal person a few moments to name that tune. It’s a neat quality, really. Insidious! I just looked up Billy Joel’s most important hits. There are so many, but I confess that there were like twenty unknown track titles to every one I did know, but here’s my little list for nostalgia purposes anyway: “Piano Man,” “The Longest Time,” “Don’t Ask Me Why,” “Only the Good Die Young,” “She’s Always a Woman,” “You May Be Right,” “It’s Still Rock and Roll to Me,” “We Didn’t Start the Fire,” and my personal favorite: “My Life.” It’s my THEME SONG on some days. On the days where I am willing to face the world and say, “Yeah. A Billy Joel song. So what?” Also, you may note that I left out “Uptown Girl,” but that is because it is easy to hate if you hear it more than once in a five-year span. On that travel journey, our rental car had satellite radio. We didn’t pay for it, it just happened to be a week where they were giving it out for free as a promotion. There was a lot of Billy Joel on those stations. And, in times when we decided to take in the local flavor of actual radio stations, we would still catch Billy Joel! (And also the Eurythmics’ “Sweet Dreams (Are Made of This)” every single day, somehow. “Sweet Dreams” is the common thread of every city in America). It became a lesson in Billy Joelism, as AlexT hadn’t heard very much of it. I guess because England has enough good music that it doesn’t feel the need to import every ounce of ours. That is fine. It was a moment that, had it been in a movie I was watching, I would have become angry. I would have shouted, “things like that don’t happen! It’s so contrived! What a waste of energy to even include that!” But it happened to us in real life. And I felt a sense of wonder, but also a little disappointment that the little mystical screenwriters the Universe has employed to write my reality are such low-budget hacks. Get it together, guys. Billy Joel is ALWAYS relevant. And for your additional pleasure, here is the ultimate Billy Joel MegaMix. It is the pinnacle of megamixes.